Hello, forex friends! 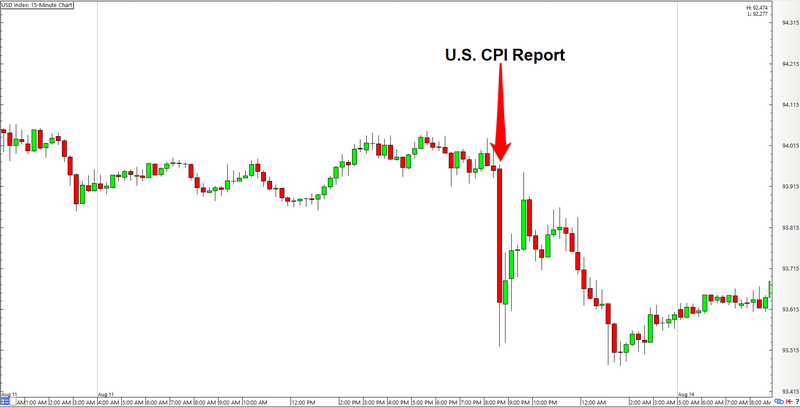 The last CPI report before next week’s FOMC statement will be released tomorrow (September 14, 12:30 pm GMT). There’s therefore a good chance that the Greenback will be getting a volatility boost. And if you wanna play this top-tier event and need to get up to speed on what happened last time and what’s expected this time, then you better start reading up. 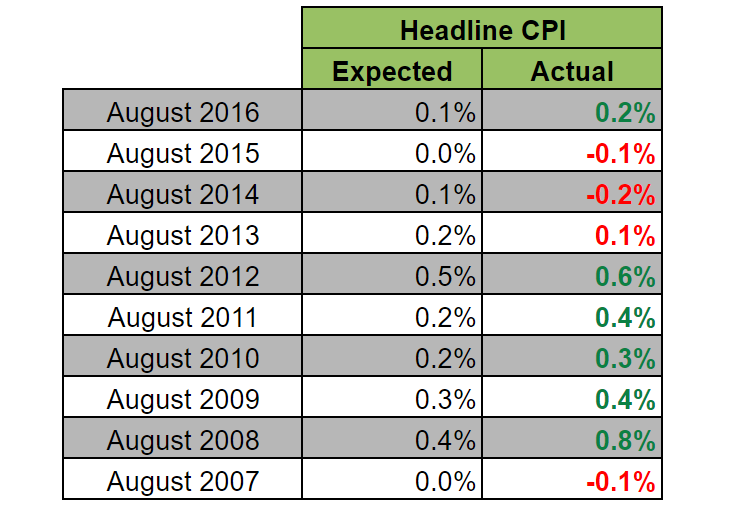 The headline reading for CPI only ticked higher by 0.1% in July, missing expectations that it would print a stronger 0.2% rise. Even so, the reading is a weak recovery from the previous month’s flat reading. And the recovery was driven mainly by 0.2% rise in food prices (+0.0% previous) and the softer fall in energy costs (-0.1% vs. -1.6% previous). If food items and energy are stripped to get at the “core” or underlying reading, then CPI also rose by 0.1%, which is the same pace as the last four months but missed the +0.2% consensus. Year-on-year, headline CPI climbed by 1.7%, which also happens to be a miss from the consensus of +1.8%. Like the monthly reading, however, the 1.7% annual increase in July is stronger compared to June’s +1.6%. Moreover, this ends four consecutive months of deteriorating annual readings for headline CPI. As for the annual core reading, it maintained the +1.7% pace as expected. Core CPI reading has heen growing at the steady pace of 1.7% for three straight months already as of July. Looking at the details the annual headline reading for CPI accelerated because of higher energy (+3.4% vs. +2.3% previous) and food prices (+1.1% vs. +0.9% previous). Overall, the July inflation report was disapppointing on the surface, which is why the initial reaction was to dump the Greenback. In trend terms, however, there were signs of recovery for the headline reading while the core reading was steady, which is likely why bulls tried to buy up the Greenback later. However, there were just apparently more Greenback bears than bulls since follow-through selling persisted and the Greenback later resumed its fall without any further catalysts. For the upcoming CPI report, the general consensus among economists is that headline CPI rebounded by 0.3% month-on-month while core CPI rose at a faster 0.2%. The year-on-year reading for headline CPI, meanwhile, is expected to improve further from 1.7% to 1.8%. However, the annual reading for core CPI is expected to ease from 1.7% to 1.6%. The implied consensus, therefore, is that CPI improved further during the August period, with the exception of the annual reading for core CPI of course. Speaking of the expected dip in annual core CPI, the implied consensus there is that higher energy and/or food prices will drive the annual reading for headline CPI since headline CPI is expected to accelerate. But as mentioned earlier, energy and food prices are stripped from the core reading. Okay, what do some of the leading indicators have to say? First up is the price index from ISM’s manufacturing PMI report, which held steady at 62.0 in August. This means that companies in the manufacturing sector are still reporting elevated input costs, but input costs didn’t accelerate compared to the previous month. Also, this does not necessarily mean that companies are passing on their higher costs to consumers. Fortunately, Markit’s manufacturing PMI report found evidence that “Firms generally passed these rises on to clients through increased factory gate charges.” Oh, and Markit’s findings differ from that of ISM’s in that Markit findings revealed that input prices in the manufacturing sector rose even further. Moving on to the prices index from ISM’s non-manufacturing PMI report, that printed a further increase from 55.7 to 57.9 in August, which means higher input costs. As for historical tendencies, economists have a tendency to undershoot their guesstimates for the headline monthly reading, so there are more upside surprises. However, don’t be too complacent in expecting an upside surprise since there have been instances of downside surprises as well. There was a string of downside surprises from 2013 to 2015, for example. For the monthly core reading, meanwhile, economists either get it right or overshoot their guesstimates. They do tend to get it right more often than not, though. To sum it up, the general consensus is that CPI generally improved in August. And according to survey evidence compiled and analyzed by Markit and ISM, companies are reporting higher input costs. And according to findings by Markit those companies are passing on their higher costs as domestic demand strengthens. And those are ideal conditions for stronger inflationary pressure, so the consensus that CPI will improve in August does seem sound. Moreover, there’s a historical tendency for economists to be too conservative with their guesstimates, resulting in more upside surprises. Chance therefore seems skewed slightly more to towards an upside surprise, at least for the headline monthly reading. For the core reading, meanwhile, analysts tend to get that right. Just keep in mind that traders are usually focused on the monthly readings, with a better-than-expected reading for both headline and core readings usually starting a quick Greenback rally. Misses, meanwhile, usually trigger a quick Greenback selloff. And the market’s reaction to the disappointing July CPI readings is a textbook example of this. And if the headline and core readings happen to be mixed, then traders are usually more focused on the headline reading for direction. Although the year-on-year readings also become more of a factor if the monthly readings are mixed. In any case, this is the last CPI report ahead of next week’s FOMC statement. And as such, rate hike expectations are very likely riding on this CPI report, so there’s a good chance that the Greenback will get a volatility boost when the CPI report comes out, as well as follow-through buying or selling, as the case might be.